Many workers spend some part of their working day in a hot environment. Workers in foundries, laundries, construction projects, and bakeries — to name a few industries — often face hot conditions which pose special hazards to safety and health. Heat stress results from a combination of internal (body) heat production from doing work and external heat exposure from the environment. Both aspects need to be controlled to reduce heat stress. Low air velocity (lowers the rate at which sweat evaporates). Perhaps most important to the level of stress an individual faces are personal characteristics such as age, weight, fitness, medical conditions, and acclimatization to the heat. Sweating is another means the body uses to maintain a stable internal body temperature in the face of heat. Sweating is effective only if the humidity level is low enough to permit evaporation and if the fluids and salts lost are adequately replaced. Of course there are many steps a person might choose to take to reduce the risk of heat stress, such as moving to a cooler place, reducing the work pace or load, or removing or loosening some clothing. But, if the body cannot dispose of excess heat, it will store it. When this happens, the body’s core temperature rises and the heart rate increases. As the body continues to store heat, the individual begins to lose concentration and has difficulty focusing on a task, may become irritable or sick and often loses the desire to drink. The next stage is most often fainting and death is possible if the heat stress is not relieved. Hot dry skin which may be red, mottled, or bluish. Shock may result and victims of heat stroke will die unless treated promptly. While awaiting medical help, move the person to a cool area and soak his or her clothing with cool water. Fan vigorously to increase cooling. Prompt first aid can prevent permanent injury to the brain and other vital organs. Heat exhaustion results from loss of fluid through sweating when a person fails to drink enough fluids or take in enough salt or both. The worker with heat exhaustion still sweats but experiences extreme weakness or fatigue, giddiness, nausea, or headache. The skin is clammy and moist, the complexion pale or flushed, and the body temperature normal or slightly higher. Treatment is usually simple: the victim should rest in a cool place and drink an electrolyte solution (a beverage that quickly restores potassium, calcium, and magnesium salts). Severe cases may involve vomiting or loss of consciousness and require longer treatment under medical supervision. Heat cramps are painful muscle spasms that are caused when workers drink large quantities of water but fail to replace their bodies’ salt loss. Tired muscles — those used for performing the work such as the arms and legs — are usually the ones most susceptible to cramps. Cramps may occur during or after working hours and can be relieved by drinking adequate amounts of liquids and salt at meals. Salt tablets are not recommended. If quick relief is necessary, a saline solution will be given intravenously. Fainting (heat syncope) can be a problem for the worker unacclimatized to a hot environment who simply stands still in the heat. Dehydration causes blood volume to decrease. The blood pools in dilated blood vessels of the skin on the lower body, making less blood available to the brain. Victims usually recover quickly after a brief period of lying down. Moving around, rather than standing still, will usually reduce the possibility of fainting. Heat rash, also known as prickly heat, occurs in hot and humid environments where sweat is not easily removed from the surface of the skin by evaporation. When extensive or complicated by infection, heat rash can be so uncomfortable that it inhibits sleep and impedes a worker’s performance or even results in temporary total disability. It can be prevented by keeping the skin clean and dry. Showering after working in a hot environment is helpful to prevent heat rash. Most heat-related health problems can be prevented or the risk of developing them reduced. The two most important methods of preventing heat disorders are hydration and acclimatization because the increase the ability of the body to tolerate heat stress. Engineering and administrative controls are also important to reduce exposures. Use the following suggestions to lessen the risk of heat stress. Provide personal cooling devices or protective clothing to reduce the hazards of heat exposure. Work practices such as providing plenty of drinking water — as much as a quart per worker per hour — at the workplace can help reduce the risk of heat disorders. Train first aid workers to recognize and treat heat stress disorders. Provide the names of trained staff to all workers. Consider an individual worker’s physical condition when determining his or her fitness for working in hot environments. Older workers, obese workers, and those on some types of medication are at greater risk. Alternating work and rest periods with longer rest periods in a cool area can help workers avoid heat stress. If possible, schedule heavy work during the cooler parts of the day and provide protective clothing. Train supervisors to detect early signs of heat stress. Allow stressed workers to interrupt their work if they are extremely uncomfortable. Body temperature will be lower. 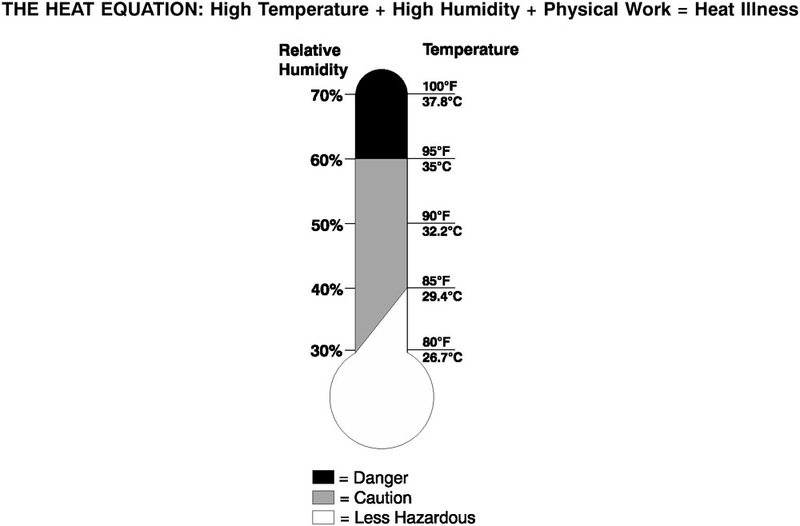 The ability to acclimatize varies among workers. Generally, individuals in good physical condition acclimatize more rapidly than those in poor condition. Approximately one week of gradually increasing the workload and time spent in the hot environment will usually lead to full acclimatization. On the first day the individual performs 50 percent of the normal workload and spends 50 percent of the time in the hot environment. Each day an additional 10 percent of the normal workload and time is added, so that by day six, the worker is performing the full workload for an entire day. The exposure time should be at least two hours per day for acclimatization to occur. 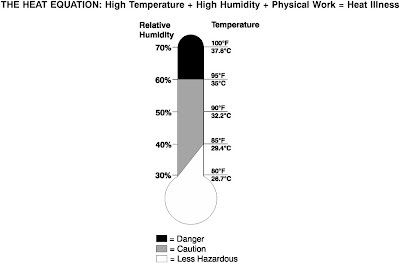 Acclimatization is lost when exposure to hot environments does not occur for several days. After a one week absence, a worker needs to reacclimatize by following a schedule similar to that for initial acclimatization. The acclimatization will occur more rapidly, so increases in workload and time can increase by approximately 20 percent each day after the first day, reaching normal work conditions by day four. New employees and workers returning from an absence of two weeks or more should have five-day period of acclimatization. This period should begin with 50 percent of the normal workload and time exposure the first day and gradually building up to 100 percent on the fifth day. Employee education is vital so that workers are aware of the need to replace fluids and salt lost through sweat and can recognize dehydration, exhaustion, fainting, heat cramps, salt deficiency, heat exhaustion, and heat stroke as heat disorders. They need to know they should be drinking at least five to seven ounces of cool water every 15-20 minutes and to avoid taking salt tablets. Salt tablets irritate the stomach and can lead to vomiting, which can result in further dehydration. When the body is unable to cool itself through sweating, serious heat illnesses may occur. The most severe heat-induced illnesses are heat exhaustion and heat stroke. If actions are not taken to treat heat exhaustion, the illness could progress to heat stroke and possible death. Dizziness and fainting or passing out. Moist, clammy skin — pale or flushed. Decreased and dark colored urine. Normal or slightly elevated temperature. Move victim to a cool shaded area to rest. Don’t leave individual alone. If the victim appears dizzy or light headed, have the individual lie on his/her back and raise the legs about 6-8 inches. If nauseated, have the victim lie on his/her side. Loosen and remove any heavy clothing. Provide a small cup of cool water every 15 minutes (if the victim is not nauseated). Cool by fanning, misting the skin with cool water, or applying a wet cloth. If the victim does not feel better in a few minutes, call for emergency help. NOTE: If heat exhaustion is not treated, the illness may advance to heat stroke. Hot, dry skin ( usually no sweating). Skin red, mottled, or bluish. Confused, loss of consciousness, convulsions. Call for emergency help and start cooling the victim immediately. Move the victim to a cool shaded area. Lay the victim on his/her back. If the individual is having convulsions, remove any objects close by to prevent striking against them. Remove any heavy and outer clothing. Provide a small cup of cool water every 15 minutes (if the victim is alert and not nauseated). Cool by fanning, misting the skin with cool water, or applying a wet cloth or sheet. If ice is available, place ice packs under the victim’s arm pits and groin area. Provide employees with information regarding heat-induced illnesses. Train them to recognize the signs and symptoms of these illnesses; possible adverse health effects of exposure to heat; appropriated medical treatments to help themselves and fellow employees; and who to contact if a heat-related emergency occurs. Other safety tips include drinking plenty of cool water (one small cup every 15-20 minutes); wearing light, loose-fitting, breathable (like cotton) clothing; and avoiding eating large meals before working in hot environments. They should avoid caffeine and alcoholic beverages because these beverages make the body lose water and increase the risk for heat illnesses. Slowly build up tolerance to the heat and the work activity (usually takes about two weeks). Perform the heaviest work in the coolest part of the day. Take frequent short breaks in cool shaded areas. This allows their body’s to cool down. Taking certain medications. Have employees check with their doctor, nurse, or pharmacy to find out if any medicines they are taking are affected by hot environments. Individuals have had a heat-induced illness in the past. Wearing personal protective equipment (like respirators or protective suits). Although federal OSHA does not have a specific regulation covering heat stress hazards, the General Duty Clause of the Occupational Safety and Health Act of 1970 requires employers to furnish a place of employment that is free from recognized hazards that are causing or are likely to cause death or serious physical harm. OSHA has used the General Duty Clause to cite employers that have allowed employees to be exposed to potential serious physical harm from excessively hot work environments.